Rai Bahadur Ranada Prasad Shaha was a true son of this soil, a man extraordinaire, whose life is work and achievements are beyond comparison. Not only did he sacrifice his life for his beloved country but his legacy- Kumudini Welfare Trust of Bengal (KWT) - stands as the highest form of philanthropy. The Trust was founded in June 1947 with the mission of providing exclusive service to the suffering humanity. A great visionary, he was indeed concerned about the well being of the poor and specially the underprivileged women. He bequeathed all his wealth for the welfare of the less fortunate. What prompted him to undertake this initiative was his childhood experience of his motherâ€™s death and his love for humanity. 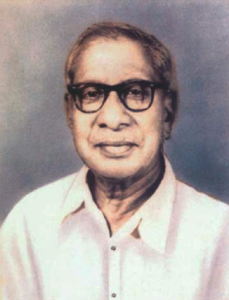 R P Shaha was born in 1896 to Debendra Kumar and Srimati Kumudini. He was only seven years old when his mother died a painful death from tetanus infection. The death of his mother left a profound impact on the young mind of R P Shaha. He made a promise that if his fate permitted, he would do something for the ailing mothers and women. After his motherâ€™s death, his father remarried leaving him restless and yearning for motherly care and attention. In this situation he was sent to Kishorgonj to stay with his maternal uncle. He spent his adolescence there, where his formal education could not go beyond the first few years in elementary school. Young R P Shaha ran away from home and began a new life in Calcutta selling newspapers at Howrah Railway Station and working as a canteen boy. 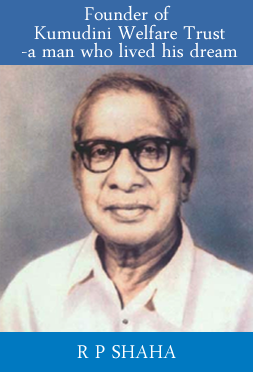 He also joined the Swadeshi Movement against the British occupation and that landed him in jail for some time. When the First World War broke out, he enlisted in the Bengal Ambulance Corps of the British Indian Army as a soldier and was sent to Mesopotamia in present day Iraq. There he performed his duties with distinction earning a medal and citation from King George the Fifth. He also received a gallantry award for saving some British oï¬ƒcers from fire in their camps. Later on he was awarded the Viceroys Commission. Returning to Calcutta he took up trading in coal, starting with door-to-door coal supply and gradually progressed to larger supply orders. Thus a wealthy Ranada Prasad Shaha was born through sheer hard work and perseverance. In 1933 he became a share holder in a joint river transportation business named â€œBengal River Serviceâ€. Later on he bought the firm. This was the core business of all his commercial ventures. By 1945, R P Shaha had already acquired the entire jute business of the Scottish firm George Henderson & Company at Narayanganj which was previously owned by an English firm named David & Company. In 1938, R P Shaha set up a dispensary with outdoor facilities at his village home. It was named after his grandmother Srimati Shova Sundari. On July 27, 1944 the then Governor of Bengal, Lord Richard G Casey inaugurated a 750 bed hospital in Mirzapur. This free hospital was named Kumudini Hospital. R P Shaha strongly believed that the foremost requirement to achieve womenâ€™s freedom and establish their rights was healthcare and education. He established an impressive institution Bharateswari Homes for girls at Mirzapur. He also founded Kumudini Girlsâ€™ College at Tangail and Debendra College at Manikganj. In July 1944 he donated an amount of Rs. 2,50,000/- to the British Red Cross Appeal Fund. In the early fifties he financed construction of the Maternity Ward of Combined Military Hospital (CMH) in Dhaka. This great philanthropist was abducted along with his only son Bhabani Prasad Shaha by the Pakistan Army and their collaborators on May 7, 1971 during the Liberation War. They never returned. His spirit lives among his successors who are on the Board of Directors of the Trust. R P Shaha was the first Managing Director succeeded by his daughter Joya Pati. His grandson Rajiv Prasad Shaha is the present Managing Director of the Trust and so the tradition goes on.